Speed, style and luxury are all combined in Lamborghini Aventador. This sports car has been produced since 2011, and came to replace the legendary Lamborghini Murcielago. Lamborghini Aventador is the benchmark among sports cars, surprising people with its design and crazy high-speed performance. 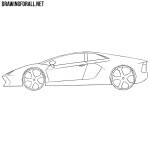 And the team of drawingforall.net believes that we are simply obliged to show you how to draw Lamborghini Aventador. The body of this crazy sports car looks very standard for all models of the Lamborghini brand, representing a very flat and wide figure. In the step number one, we must sketch out this very flat and wide body using very light lines. Note that the angle between the hood and the windshield should be minimal. To make our blank more like a car, in the second step we will add the most basic details. First, let’s sketch the characteristic and very recognizable angular headlights. Next sketch the outlines of very flat windows. After that sketch the angular rear-view mirror, an air intake on the side of the body. Be especially careful when you draw the wheels, because they should be symmetrical. 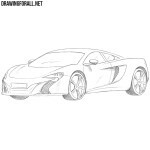 Sketch out the outlines of the angular bumper and air intakes on the bumper. Using a pair of light and long lines, we sketch the outlines of the windows as in the example below. Next, we outline the door, a barely noticeable handle on the door and design lines on the side of the body. With the help of a pair of semi ovals create the outlines of the wheel arches. Next, using a pair of lines, make the wheels more voluminous and draw the contours of the rims. Work with the creation of the blank is completed, and starting with the step number four, we will begin to draw the details and the final design of the car. So, with the help of clear and dark lines, we carefully draw out the details of the bumper, headlights and hood. A very difficult task is to draw all the lines on the hood, but we are sure that you will cope with this. Draw the Lamborghini Logo and remove the guidelines. Let’s now move on to the top of our cool sports car. With the help of confident and precise hand movements draw the outlines of the roof, windows and the mirror. 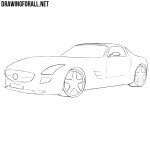 To make the drawing cleaner, we remove unnecessary guidelines at the top of the sports car. For this task we need to use very clear and dark lines. So, the body of the Aventador should get such a fast and sporty design. In the sixth step we will finish drawing the body of our legendary sports car. In order to achieve the best effect, first draw the long longitudinal design lines on the side of the body. Next, draw out the door and the details of the air intakes. We are completing the body, and before we start drawing the wheels, let’s remove all the remaining guidelines that we drew in the first three steps. The seventh step will probably be the most difficult in this and all car drawing tutorials. As you can see, here we will draw out the wheels. First of all, carefully circle the wheels and outlines of the rims, then draw out the spokes. Please note that the wheels should be very large and wide, and the height of the tire sidewall should be very small. 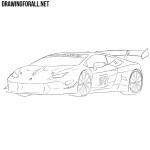 The drawing of Lamborghini Aventador is almost complete, and to make it more realistic, let’s add some shadows. Using hatching, draw shadows in the least lit areas. Pay special attention to the areas inside the air intakes, under the arches and the cast shadow under the car. 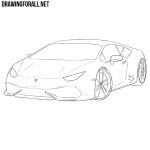 Compare your drawing with our example, if they are similar, then now you know how to draw a Lamborghini Aventador! If you are a real fan of really cool cars, then you will certainly love Aventador. The proportions, interior, engine performance and much more in this car are made at the very highest level. 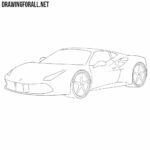 And now with the help of our drawing lesson you have become a little closer to those who created the design of this crazy sports car, because any car, including this one, begins with a sketch on a piece of paper drawing tablet.